A few weeks ago, Janice of Color, Creating, and Quilting and Jen of A Dream and a Stitch decided to make a Shadow Quilt using a pattern designed by Debora of Studio Dragonfly Quilts, and they asked the other New Quilt Bloggers if they’d like to join in. Although I’m really busy at the moment, I found the idea of making a Shadow quilt pretty tempting. And fast! So fast in fact that I made two! After studying the pattern, I decided to play with warm and cool colors and see what developed. After looking at my stash, I choose two different purple batiks for the background and shadows, and a series of yellows, oranges and reds for the squares. I’m really happy with the results—I think the warm colors really come forward, and the purples recede, creating a nice 3D effect. This mini quilt uses a 4 x 5 block setting, and finishes at 17” x 21”. I quilted this wall hanging very simply, by stitching in the ditch around the shadows and the squares. I decided to add a flange for a nice pop of color. I think if I was to do it over, I might cut the flange just a tiny bit smaller, but I think it works none the less. While I was working on my purple wall hanging, I kept texting updates to a friend of mine who was really encouraging. In fact, she absolutely loved it, so I decided to make her one too since they are so fast and easy and hey, she's my bestie! Her favorite color is teal, with orange a close second. The thought of using opposites on the color wheel was very interesting to me. I was especially eager to see how they played off each other to create a 3D effect, and I think the result is wonderful! I kept finding lots of orange fabrics in my stash and I simply couldn't decide which ones to include so I included them all! I made this mini quilt 5 x 5, so it finishes 22" x 22". I didn’t get her quilt done because I went to see my daughter in college this weekend, but I know it’ll finish up fast. Alice loves sparklies almost as much as she loves teal and orange so I had to put a glittery orange square in the quilt! I totally love how easy Shadow quilts are to make, and I encourage you to make one and share the results in my Quilting with the Inquiring Quilter Facebook group, or on Instagram with the hashtag #shadowminiquilt. Be sure to visit these participants to see the other Shadow quilts! Tell me…if you made a Shadow quilt, what colors would you use? How would you quilt it? Boy that was a fast quarter! Looking back, I am pretty proud of what I was able to get done. As my regular readers know, I’m participating in the 2016 Finish Along. To participate, you post a list of WIPs you want to complete at the beginning of the quarter and then at the end of the quarter, you recap your finishes. 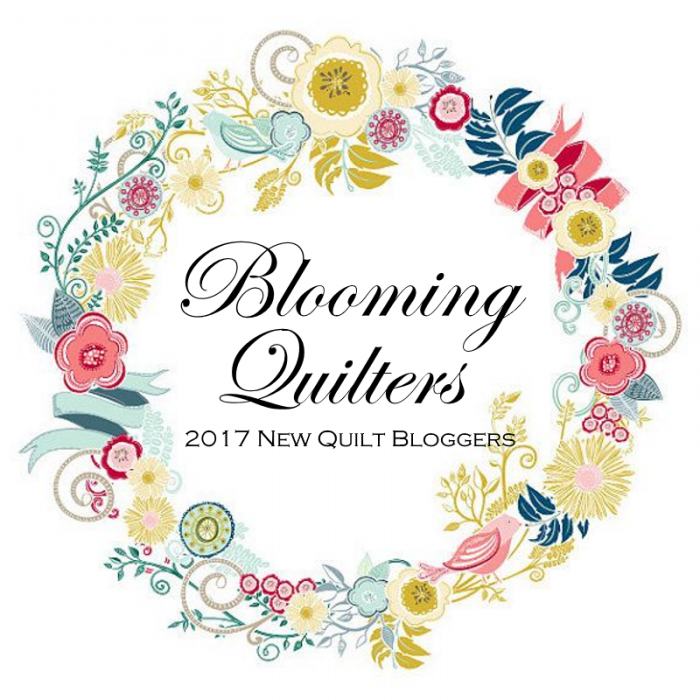 During the quarter, you have this great online group of fellow quilters rooting you on and encouraging you to turn those WIPs into finished projects. So far it’s been a great experience and I encourage you to play along! My list of Quarter 1 WIPs is here. You’ll see that it’s a long list. While I was trying to gather a list of WIPs together at the beginning of the year, I decided to simply list them all rather than shortening the list by figuring out which ones I wanted to get done first. Here are my finishes for Quarter 1. I’m currently hosting a quilt along for Stepping Stones if you want to try this fast and easy quilt pattern for yourself. Just click the Stepping Stones QAL tab above to learn more. When I design a quilt pattern I like to show it in two different colorways whenever possible because I want the people who purchase my patterns to be able to imagine their own color and fabric choices in the quilt rather than just mine. By showing two different colorways I hope to do that. Stepping Stones can be made scrappy (as shown in the neutral version) or planned (as shown in the bright version). My guild has a party every February to celebrate our anniversary. My bee mates and I decided to make the centerpieces, and we needed about 100 fabric flowers and felted wool table toppers. I made about 40 to 50 flowers and my bee mates helped make the rest. The table toppers were mostly made by my bee mate Pam, but after Pam fell ill at the last minute, Becky and I each made three to get them done. Although I can't say my needlework is anywhere as good as Pam or Becky's, I’m still pretty proud of the table toppers! I’ll tell you, at times it seemed like this table runner didn’t want to get made. I started working on it at a bee retreat weekend and thought it wouldn’t take much time to finish it. The weekend I was planning on finishing it, our daughter came home from college. Then other things came up and the project was put on the back burner until well after Valentine’s Day when I finally found time to quilt and bind it. Better late than never, I say! I’m working on updating my Quarter 2 WIP list, which is due on April 8th for those of us participating in the 2016 Finish Along. My original list was pretty comprehensive, but some newer, more important projects have come up that I want to add to the list. So stay tuned! My Valentine’s table runner is almost done! I got the quilting finished the other day and I’ve trimmed it up, sewn the binding together, and now I’m ready to sew the binding on. I’ve never ventured into machine-finishing my binding before, but I may get brave and try it. I think I simply prefer the look of hand-sewn binding, but I’m intrigued by the idea of finishing a binding fast, so we’ll see. My Valentine’s table runner has applique hearts and letters and I used two different methods to finish them. For the letters, I chose the tried and true raw-edge fusible applique method. For that method, you trace your shapes in reverse onto the backing of some fusible web, fuse the webbing to the back of your fabric, then cut the shapes out right on the line. Finally, you fuse the cutout shapes to the background fabric following manufacturer’s directions and then finish the raw edge. Because the letters were full of curves, I choose to finish the edges using a straight stitch stitched close to the raw edge of the applique. For the valentine hearts, I used the turned-edge fusible machine applique method. With that method, the edges are finished (turned under) and not raw. I also finished these edges with a straight stitch. If you want to learn more about this method of applique, I’ve added a tutorial for you on my Answers tab. What about you? Do you like to do applique, and if so, what methods have you used? I'd love to know!